One of the masks has been repeated, I was wondering if it is all that obvious. I quite like this. Seems busy at first, but then - if you take the time - you can begin discovering some interesting colors and shapes. The crop may be a little too long, but this could be a matter of preference. Interesting image. I wouldn't have noticed the repetition if you hadn't mentioned it, and even with your prompting, it still took me a while to catch it. You could remedy the situation by cropping the lowest row, making it a tad shorter as llewpics suggested. llewpics and Ken thanks for your thoughts, a crop as you both suggested is probably the way to go, maybe at the chin of the mask bottom right. Nice fully framed image there Pete. I find myself liking the two top middle ones the best with their graduated colors. The black areas near the bottom take a little away from the pattern, but it is still successful. As for the repeating, it wasn't detectable at a glance. Once I read your caption, I see that the left side masks are the same except for the colors, but you have to look for it. I cloned the bottom one in to fill the gap, but as Ken and llewpics pointed out I would probably been better to crop the bottom, but the exercise was fun to do. WOW. Is that even real? Sorry to be a little negative, but this gives me the impression of being there but not exploring my surroundings. 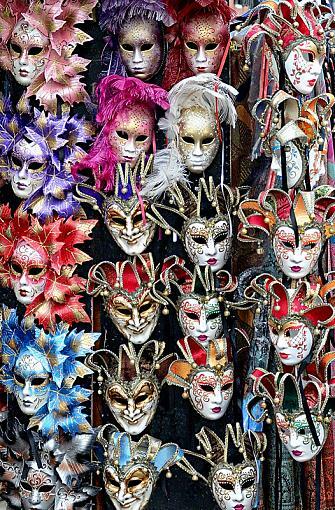 It feels like a documentation of a mask booth at a fair rather than a more original composition. If that's what you wanted, though, perfect. Hi Valsi thanks for your thoughts, this is a crop from a shot I took of a merchants stand in Venice, so you are right in a way but I did explore my surroundings, this is just one of the many things that interested me there. Anybody have and good home made face masks?